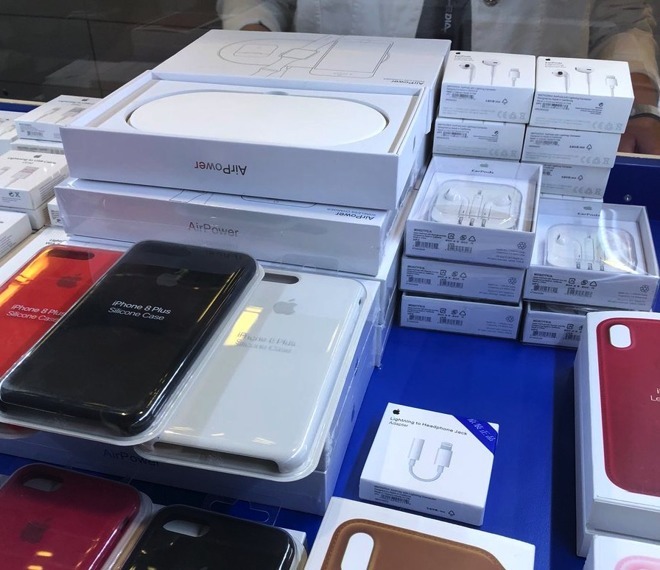 A traveler has spotted what appears to be Apple's unreleased AirPower Qi charging pad —but the device is clearly a knock-off, despite claims to the contrary. Apple's multiple device Qi charging pad, expected at some point in 2018, was allegedly spotted at the Vienna airport by Twitter user "ThePeterAllan". However, not only is some of the Apple product packaging off, most notably the Chinese labeling on the Lightning to headphone jack adapter in the center of the picture, but the device is clearly a knock-off. The exact same pod was found by AppleInsider at assorted venues, including eBay and Aliexpress. The Tweet was first spotted by The Apple Post, and not checked for veracity at all. However, in discussing the tweet, the publication has a fundamental misunderstanding about how the FCC works. While some international regulatory agencies have no secrecy clause, the U.S. version does, which has allowed Apple to release products "today" in the past. So, the lack of a FCC listing for the device means nothing. Additionally, the venue, citing "sources," previously predicted the AirPower shipping in March. AirPower appears to be connected to its charging puck through a single Lightning cable. The pad itself is large enough to comfortably fit an iPhone X, Apple Watch and an AirPods wireless case, and can charge all three at the same time. Seen in a short promotional video aired during the iPhone X release keynote, when an iPhone 8, iPhone 8 Plus, iPhone X, Apple Watch, or AirPods Wireless Charging Case are placed on the pad, a special tone is played and onscreen animation is displayed when they connect to the wireless charging pad. Apple has yet to announce the price for the AirPower charging pad. Apple has only said that the device will ship in 2018.